1932 : Unholy Love de Albert John Ray โดย Lila Le. 1933 : Madame Bovary โดย Jean Renoir. 1937 : Madame Bovary โดย Gerhard Lamprecht นำแสดงโดย Pola Negri. 1947 : Madame Bovary โดย Carlos Schliepe นำแสดงโดย Mecha Ortiz. 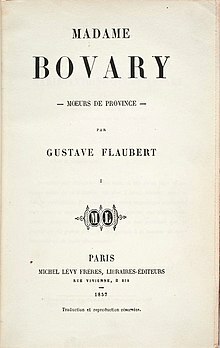 1977 : Madame Bovary, c’est moi de Zbigniew Kaminski นำแสดงโดย Jadwiga Jankowska-Cieslak. 1989 : Sauve et protège d’Alexandre Sokourov นำแสดงโดย Cécile Zervudacki. 1991 : Madame Bovary โดย Claude Chabrol. 2000 : Madame Bovary โดย Tim Fywell นำแสดงโดยFrances O'Connor dans le rôle principal. หน้านี้แก้ไขล่าสุดเมื่อวันที่ 24 เมษายน 2559 เวลา 00:58 น.